In 1996 the Monday Night Wars were in full effect. Despite the fact that they were losing, I was all in with the WWF. Of course, I was a wrestling fan and watched both companies. But when I had to choose, I always went with Vince McMahon and company. 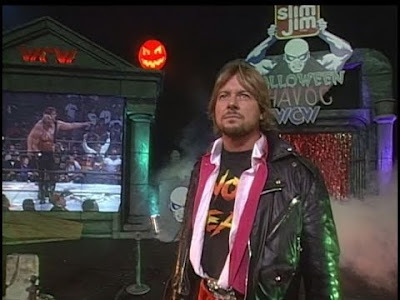 But on a Sunday night in October 1996 I was listening to the Halloween Havoc pay per view. Back then you could hear, but not see PPV via 'scramble vision' on cable. It's probably highly unethical, but I was a poor 24-year-old saving up for a wedding. Hulk Hogan had just beaten "Macho Man" Randy Savage in the main event. As a newly turned heel, Hogan celebrated in the ring with other nWo members. Hollywood Hogan taunted the crowd and sang his own praises. Then all the sudden the familiar bagpipes hit. My attention was immediately focused on the TV as the image scrambled in and out. But there was no doubt "Rowdy" Roddy Piper was the latest WWF Superstar to defect to WCW. Hogan of course sold the arrival like a champ. He looked as if Piper had just risen from the dead and had come to Halloween Havoc to haunt Hogan. The rivalry from 11 years prior was about to get a second life. Piper ripped Hogan to shreds on the mic and the two engaged in a year long feud that culminated at the following Havoc, with Piper winning in a non-title cage match. As I mentioned, I was all-in for WWF so Piper's arrival shocked me. I don't recall this one being spoiled by the internet. But the move also really disappointed me. I loved Hot Rod and just months earlier he had battled Goldust at WrestleMania 12. I figured when he had stopped appearing he was on another one of his sabbaticals from the company and would eventually be back. Eventually he was, but he spent a big chunk of his career with WCW.